Unique Moments Photography from Gig Harbor Washington, traveled to Santa Cruz California to capture our close friends wedding. The ceremony took place at the Roaring Camp Railroad and the redwoods National forest in Felton California. We have known the groom since birth and it was our honor to photograph this wedding for Robbie and Arianne. Our trip started off with a long long rive down the Oregon coast so we took advantage and captured a few pics at canon beach. The Friday before the wedding was the rehearsal and rehearsal dinner which was hosted by the grooms parents. The bride and groom live in Massachusetts as the groom is honorably serving our country in the United States Coast Guard. When asked what they wanted for dinner both bride and groom said ” Tacos “. The parents happily complied and hosted a BBQ dinner for 80 guests with some of the best Tacos we have ever had. We took the opportunity to recreate a bridal party picture from the brides parents wedding and created an Old Time Shotgun wedding image. It was a ton of fun to do and it gave us the opportunity to meet the brides family before the wedding day arrived. Loads of fun. The wedding started off with Bride getting ready at her hotel and the groom who was out surfing before he was to report to the venue with all the guys for a first look at the railroad bridge at Roaring camp. The bride got dressed in the old school house and before we knew it, It was time for the first look. After the first look, it was time for formal pictures and then the bride was hidden away as guests arrived for the wedding ceremony. So here is the coolest thing ever for a wedding ceremony. 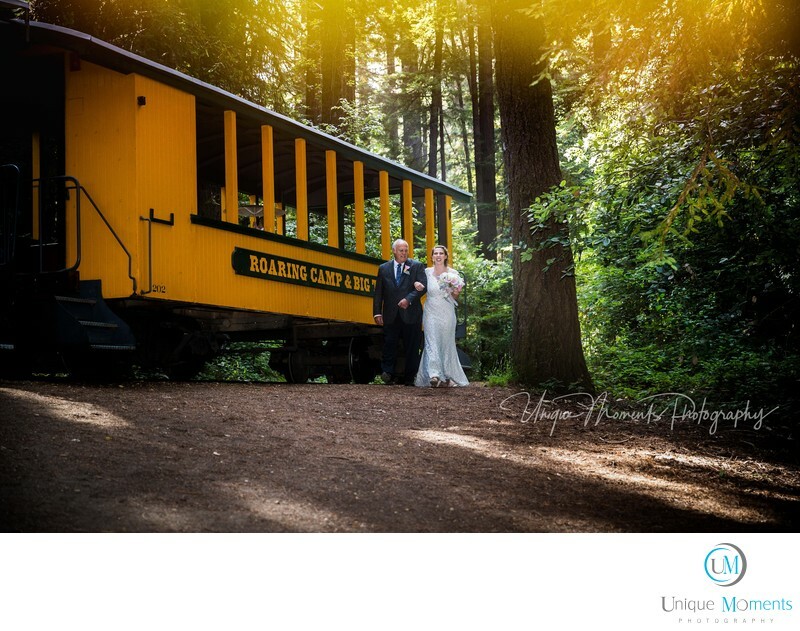 All the guests arrived and boarded an antique steam engine and box cars to ride to the top of the mountain, through the redwood national forest, to the wedding location which was at the top of the mountain. All the kids were elated to get the opportunity to ride on an old time steam engine railroad . And, I did not see any parents that were not grinning from ear to ear. Total thrill. After everyone boarded the train, the first stop was at the old school house to pick up our beautiful bride who was hidden away at the school house. All the bridesmaids escorted Arianne to the caboose and hid her with large umbrellas so that none of the guests could see her. Then it was a climb up the mountain with all the girls and guest’s singing ” Going to the chapel to get married ” over the trains sound system. Definitely the ride of a lifetime for the bride and groom and a ride none of the guests will ever forget. But the best was yet to come . Everyone exited the train and quickly went to the area where vows were going to be exchanged. Then it happened. Arianne and her father exited the caboose of the train and started to walk down the dirt path, among the giant redwood trees of this national forest, with the theme from Star Wars blazing loud and clear. It was absolutly the best wedding processional we have ever seen or have have been a part of. Simply fantastic. No Tears from anyone. Just a great sense of joy and excitement for these two who were about to start their lives together. Vows were exchanged, parents were wiping tears of joy from their eyes, and after a kiss for luck, these two love birds were ready to party the night away. A ride back down the mountain thrilled all the guests and everyone met at the back of the train for a group photo. It was a total blast to be a part of this. The bride and groom made a grand march entrance to the reception venue where they were introduced as husband and wife and promptly performed their first dance for all the guests. After dinner was served, father daughter dances and mom son dances were performed followed by speeches and cutting the wedding cake. This wedding was simply off the charts and No One who attended will ever forget the experience of being a part of this. The kids were blown away with the railroad theme and ride. Everyone got to ride through the redwood national forest and see this beautiful area and vistas. It was over the top awesome. So all in all, on a scale of 1 – 10 we are going to rate this a solid 100. How could we possibly go wrong here. Everything was perfect, we got a chance to hook up with all the families, and everyone had a great great time. Robbie and Arianne, thanks for letting us photograph your wedding. We had a Blast. Location: 5401 Graham hill road Felton Ca 95018 .